If you made up your mind to launch an online business and started this challenging task choosing an ecommerce platform for your online store then most likely you've opened Google and bogged down in a bunch of expert reviews of most popular ecommerce platforms. Such texts contain too many words but do not provide a clear answer to which of platforms is best for you. When most of the beginners sign up for a trial of ecommerce website solution they start clicking on everything to see how much functionality is there. Wrong, wrong, wrong. Let's say you are going to buy a new car. And you come to a car dealership. Probably, you won't press each button and pedal in a car to see what will happen. You will take a test drive and ask a dealer questions along the way: "What kind of gas mileage is there? What is the interval of oil changes? What is covered by the warranty?". When you choose a car you have an understanding of what you need and how you are going to use it. When choosing an ecommerce platform, beginners, as a rule, don't have such an understanding. The most important question you should ask yourself choosing an ecommerce platform: what is the main goal of your online store in the first year after startup? Why do most businesses, including online ones, die within the first year? The reason is simple: an entrepreneur sells the product that the market doesn't need. Or the competition is fierce and there is nothing that differentiates him from competitors. This means that the primary concern is to find out whether your online business will be successful or not, instead of looking for ideal ecommerce platform. It is necessary to understand that people do need the product you offer. In 1982 Colgate tried to enter the frozen food market with Kitchen Entrees. The failure was in consumers' perception of the brand. Colgate is known for its product, and it is a toothpaste and no other. And we all know that you shouldn't swallow toothpaste. That's why Colgate Kitchen Entrees never had a chance to gain market of ready-to-eat meals using their brand name on the packages with food. Samsung, Sony, and LG stopped production of 3D TVs. Hundreds of millions of dollars were invested in production and promotion. Despite all the efforts, people don't want to sit in front of the TV in glasses that tire their eyes. And there is no content provider who wants to invest in creating content for 3D television. The story ended. Why should you keep in mind these examples when choosing an ecommerce software? The first thing you must figure out is whether there is a demand for your product. And that requires saving on things that don't make you any money. This brings us to the development of online stores from scratch. New store owners should never, ever hire a web design team to build a custom ecommerce website at the very beginning of their online venture. That's like planning to build a nuclear submarine when you don't know how to build a small boat. Start small. The simplest solution is to turn your attention to hosted ecommerce software to prove out your business idea first. You'll get everything needed in the initial stage including hosting, integrated payment gateways, shopping cart software, free design templates in one place. There are dozens of viable options for building your own ecommerce website. And they all promise that they are the one, that is the best ecommerce platform you've been looking for. Start from your requirements, not someone else's promises. 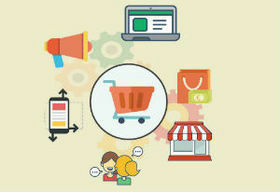 Here are several criteria that should be considered in choosing an ecommerce platform. Before you make a choice in favor of one or another platform check the ease of work with a content. There will be a lot of ongoing change while managing your ecommerce website. Though adding content is the basic feature for any ecommerce solution, the difference is in the level of usability. With some platforms, you will get on well, with others hard. It will be useful to choose a platform with an easy administrator's management and control interface. Far from all developers keep in mind that their clients are not as technologically savvy as they are. Besides, if you are not going to work alone with the website check the ability to provide an access to admin panel with a certain set of rights to other people. An ecommerce website should automatically calculate a total for the order and accept payments from customers, otherwise, it serves no purpose. An ecommerce platform doesn't have to cover any payment gateway in the world, but it should have the payment gateways you need. If you are going to sell internationally, then you should be able to accept international payments through your website. Also, check whether it has the currency you use. Slow page loading speed. If a platform loads a page for a couple of seconds, neither Google nor Bing will place your website on the first page of search results. Tag H1. It must be higher than other tags of the group of H on the page. Also, H1 heading should contain a keyword that matches the term on which people can find you. Absence of adaptive design. Lots of consumers are shopping on mobile devices. An online storefront must be mobile-friendly. Google finds a mobile adaptive design an important factor for ranking a website. Social sharing buttons. Some platforms require separate modules for adding and customizing social sharing buttons. Some platforms allow using your own domain name as a premium feature at an additional cost. Registering a domain name with a third party certified domain registrar is a strategic step for your online business. Choose a domain name that will work well with your brand. If a platform doesn't allow you to use your own domain name reconsider it. If you plan to accept payments online it would be wise to choose an ecommerce platform that supports some level of security such as SSL (Secure Sockets Layer) encryption of sensitive data - credit card data, birthdates and other. Some platforms provide SSL certificates as a basic feature, others offer their clients to purchase the certificate. Though this article doesn't include names of ecommerce platforms, it provides the algorithm of how to make a final decision. Now when you know the key features of ecommerce platforms to which you should draw your attention to, don't waste valuable time, choose ecommerce software and start selling online. A detailed ecommerce platform comparison you can find here.